2-Pack of 22 oz. Fire Suppression Foam Liquid Concentrate for Extinguishing Class A and Class B Fires. 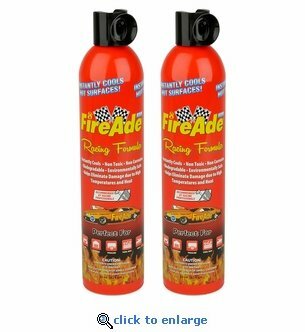 FireAde 2000 Racing Formula fire fighting agent is biodegradable, environmentally safe and easy to use. Quickly extinguishes fires involving wood, paper, cloth, oil, gasoline, flammable liquids and grease. Many racing safety crews, fire departments and law enforcement personel carry FireAde 2000 fire suppression units for quick, first response to small fires and flammable fuel spills, eliminating expensive clean-up and damage to property. Easy to Use - Shake can and press down button. Contains UL/ULC Listed Foam Concentrate 14CY, UL Tested and Approved as a Wetting Agent in accordance with ANSI/NFPA 18 for physical properties and fire extinguishment 93VO, ULC Listed Air Foam Concentrates, this product is PH Neutral and contains NO Toxic materials listed in SARA 313 or RCRA 40 CFR part 261 and 262. FireAde has been tested by more worldwide government agencies.